In Asian > Asian Statues > Show & Tell. 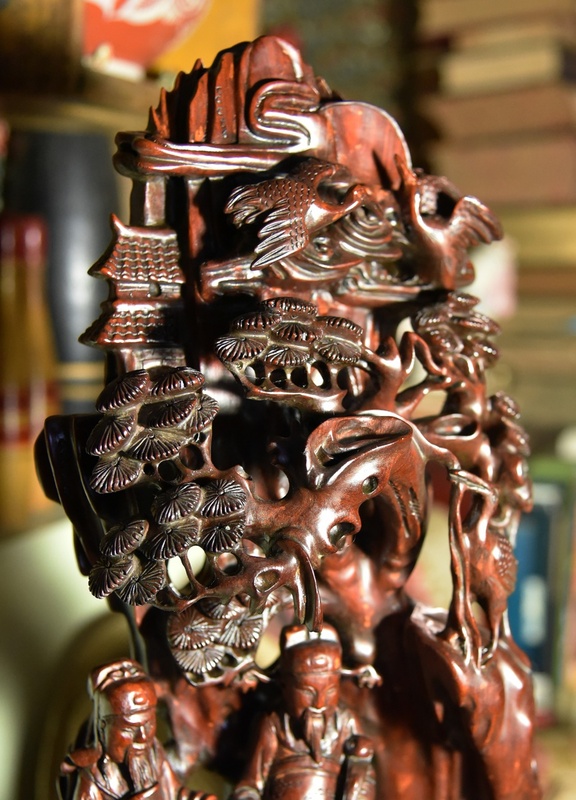 A friend cleaned out someone's attic today and brought me these two Chinese carvings. This one is my favorite, although it would be much better cleaned up and waxed/oiled. This piece is 24 inches tall and beautifully done. Does any one know what this image is of? or anything about it - including value? thank you! happy new year everyone at CW! Incredible...looking forward to some info a but it. thank you racer4four! i just finished waxing and polishing it and i replaced the pics w/ new ones which are better. 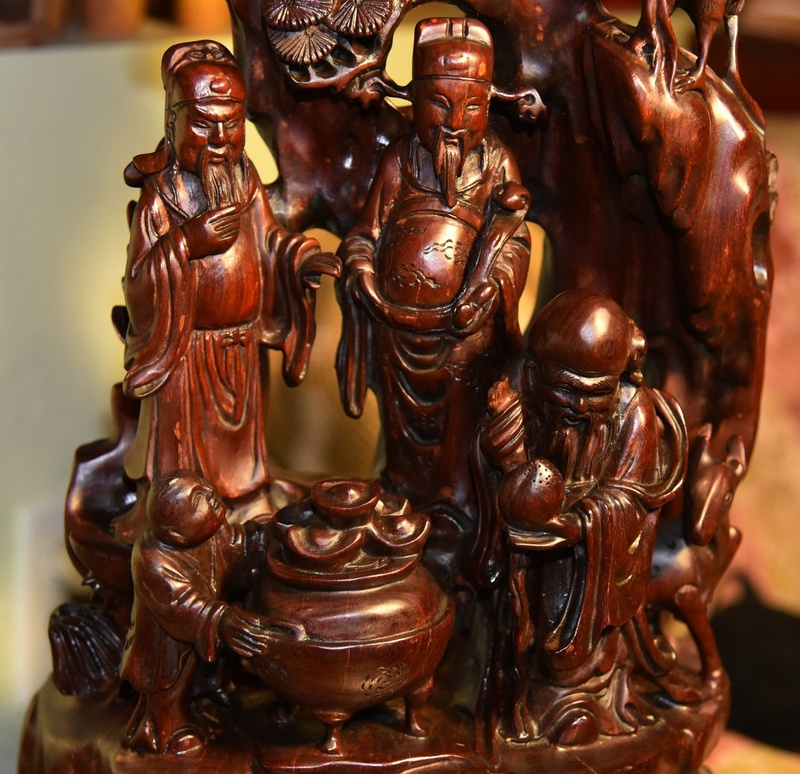 A CARVED ZITAN FIGURE from china,which is very similar to Ebony, rare and great color. i think it probably is rosewood, or at least made to look like rosewood. putting some wood wax on it and polishing it sure did bring it to life. does anyone know the word for the little carved flowers you see on this piece? there's a word for them and i'd like to search pieces which have these. thanks! thanks jim. there's a name for them and i forgot what it is. begins w/ 'pin' i think. Forget about Zitan wood, not even close to. It's dyed so can't identify the wood, but for the style of carving, I guess it's made from Lychee wood. It was a popular export product from China in Republic period, I had a few. Scratch the bottom to see the true color of wood, should be brownish. thanks shrine! but i don't see any sign of die on it and when i scratch the bottom, it's the same color. also, i did wax it w/ Feed 'n Wax Wood Polish and it really works well on it - brings out the richness of the wood. there's no laquer on this piece. kyratango? I just moved to a new place and it's definitely a disaster to pack up, move to storage and unpack my antique collections. ho2cultcha, trust me, it's dyed and lacquered. or should I use the word 'stained' and 'Varnished'. For wood craft, if is made of bare wood, except softwood like pine, you could find pore/vessel with naked eyes. Even if some hardest wood like Zitan, they do expose their vessels. One this piece, I can't see any. Shrine, when fully enlarged (by clicking both ctrl shift buttons and +) you can see the wood texture on pic 1, specially on the belly of personnage on the left and the censer! I'm going to be stubborn on this one. there is NO varnish or laquer on it. the shine that you see is from the Feed-N-Wax i had just applied to it. it has absorbed it since then and is no longer shiny like that. i can see the pores of the wood clearly now. the wood is very heavy and hard. it might be stained, but i don't think there's any laquer or varnish on it. i don't think it would have absorbed the wax if it had been varnished or laquered. regardless, i appreciate your feedback Shrine! 1, the Heart Wood which is at the centre of stem, usually looks much darker than the outer part. It's formed by retired cells. When the tree is young, there is no Heart Wood, and as it grows, the new cells form at the outer rim, and the old cells retire to become Heart Wood, which is dense and strong, supporting the tree from inside. When people mention rosewood furniture, they are talking about the piece made from heart wood of some rosewood trees. 2, the white matter, which is formed by the living cells, at the outer rim of stem. It transfers nutrients and water. Can't be used in rosewood crafting. 3, the skin, we all know it. So, where the tree is rich in oil and resin, these matter sometimes penetrate the dead cells and trapped there. These cells would become darker, in some cases, black. That is what we called Black Vessel. Come back to this case, we can see some black vessel but that doesn't necessarily lead to bare wood. Like varnish film on French furniture, people see through it. In Chinese woodcraft, Tong Oil is the traditional way to make clear lacquer. I found Tong Oil in nearby hardware warehouse, quite expensive. ho2cultcha, Please check the reply I put above. To your question, the wood would remain some ability to absorb oil if it's treated by Tong Oil. Tong Oil penetrates wood a bit, not like normal varnish, which stays on the surface. Tung oil, lacquer & varnish are all different finishes. thanks walksoftly! 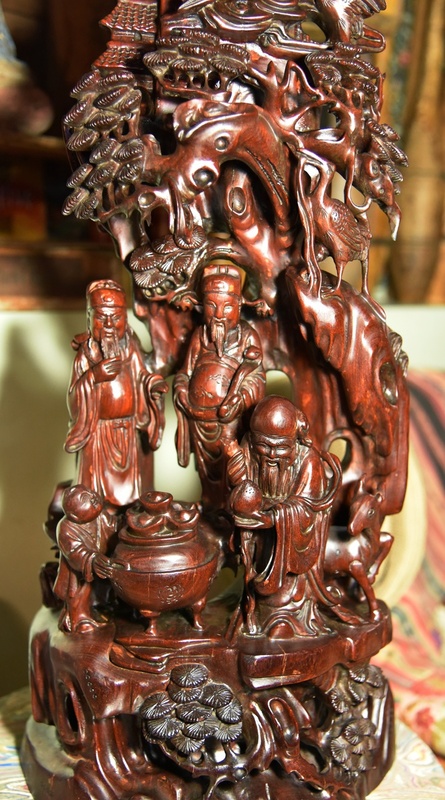 yes, shrine - i agree that the piece had been treated w/ something like tung oil, but that is not lacquer or varnish. i do use tung oil sometimes, but currently i prefer the oil / wax i'm using. it's easy to apply and makes the wood come alive.